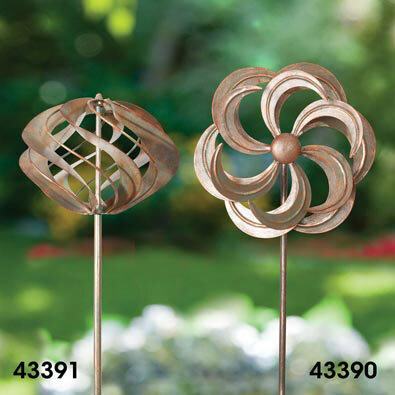 Add the perfect accent to smaller garden spaces with our antiqued bronzed colored wind spinner. Small enough for a garden bed or large patio flower pot, it will add a delightful motion to your garden as it spin in the wind. Made of weather resistant iron. This measures 32" high with a 4" forked stake to secure to the ground. Minor assembly required. 7" diameter. Add the perfect accent to smaller garden spaces with our antiqued bronzed colored wind spinner. Small enough for a garden bed or large patio flower pot, it will add a delightful motion to your garden as it spin in the wind. Made of weather resistant iron. This measures 32" high with a 4" forked stake to secure to the ground. Minor assembly required. 8½" diameter. *Sorry, express shipping and gift wrapping not available for Flower Mini Wind Spinner Stake.